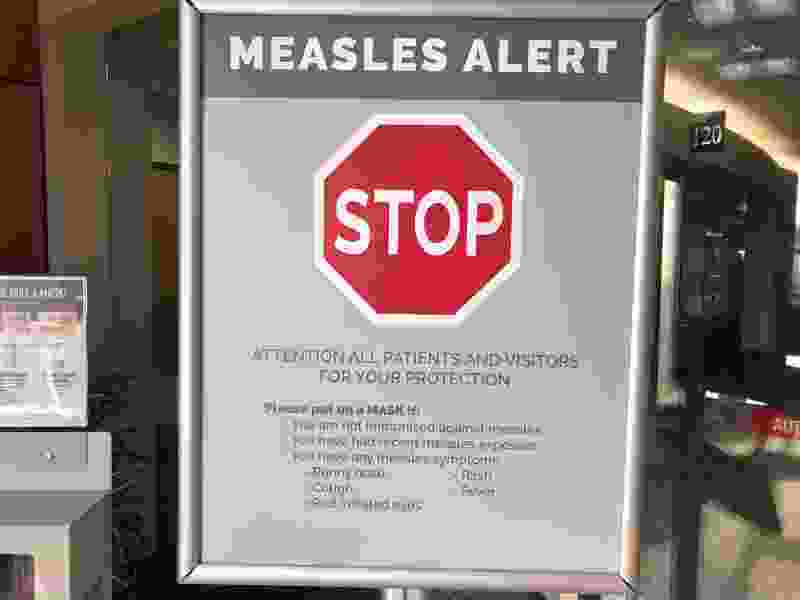 (AP Photo/Gillian Flaccus,File) In this Jan. 30, 2019 file photo signs posted at The Vancouver Clinic in Vancouver, Wash., warn patients and visitors of a measles outbreak. A measles outbreak near Portland, Ore., has revived a bitter debate over so-called personal belief exemptions to childhood vaccinations. Four percent of Washington secondary school students have non-medical vaccine exemptions. Ethan Lindenberger, frustrated by years of arguments about his mother’s anti-vaccination stance, staged a quiet defection via Reddit. The Norwalk, Ohio, teenager needed advice, he said, on how to inoculate himself against infectious disease and his family's dogma. At 18, he was old enough, Lindenberger explained. He wanted to get vaccinated. But he didn't know how. "My parents think vaccines are some kind of government scheme," Lindenberger wrote days before Thanksgiving. "But, because of their beliefs I've never been vaccinated for anything, god knows how I'm still alive." As anti-vaccination movements metastasize amid outbreaks of dangerous disease, internet-savvy teenagers are fact-checking their parents’ decisions in a digital health reawakening — and seeking their own treatments in bouts of family defiance. In three states, at least three self-described teenagers told Reddit they have a common problem: Their parents are staunchly opposed to vaccination, and they fear for their health if they do not take action. Different state laws affect how old minors need to be to make their own medical decisions. Lindenberger's post drew more than 1,000 comments, including detailed information on navigating the health care system in one post from someone who identified as a nurse. The tension over vaccines started years ago, the teen told The Washington Post on Sunday, after he began to notice his mother posting anti-vaccination videos on social media. His friends were getting vaccinated. So what was happening in his house? Lindenberger read scientific papers and journals. He pulled up Centers for Disease Control and Prevention studies on his phone at the dinner table, hoping his mother would relent and get him and his four younger siblings — now ages 16, 14, 5 and 2 — vaccinated. "I looked into it, it was clear there was way more evidence in defense of vaccines," he said. His mother resisted and claimed there were autism risks from vaccines, a common argument used by anti-vaccination groups that has been widely debunked. His mother, Jill Wheeler, was angered by his pursuit, she told Undark, an online science magazine. "It was like him spitting on me," she told the site, "saying 'You don't know anything, I don't trust you with anything. You don't know what you're talking about. You did make a bad decision and I'm gonna go fix it.' "
Wheeler did not respond to a request for comment. In Ohio and 16 other states, parents can opt out of required vaccines for philosophical reasons. All but three states allow the exemption on religious grounds. All 50 allow it for medical reasons. Late last year, Lindenberger, now a high school senior, confided in a pastor, who suggested he was legally free to make decisions. On Dec. 17, he walked into an Ohio Department of Heath office in Norwalk and received vaccines for hepatitis A, hepatitis B, influenza and HPV, according to a shot record viewed by The Post. He has shots listed for tetanus and hepatitis B, administered when he was 2 years old, but Wheeler told Undark he received the tetanus shot after he accidentally cut himself. The other must be a paperwork mistake, she said. Lindenberger said he has seen a growing discussion online about teenagers emboldened to make their own health decisions and pursue vaccinations. In Washington, a self-described underage teen wrote in January that his or her mother would not allow vaccines. "I, as well as my siblings, hold the ideology that vaccines are a public health issue, and a personal responsibility to the benefit of the population, not a right you can revoke from your children," the teenager wrote. Washington state has become a battleground between anti-vaccine groups pushing for relaxed regulations and concerned parents watching a measles outbreak strike the Pacific Northwest, a well-documented anti-vaccination refuge. At least 56 people in Washington and Oregon have contracted measles — a potentially deadly disease for children - in an outbreak near Portland, Oregon, triggering a public health emergency in neighboring Clark County, Washington. "Measles is exquisitely contagious. If you have an undervaccinated population and you introduce a measles case into that population, it will take off like a wildfire," Clark County Public Health Director Alan Melnick said. Another teenager, who in September identified himself as a 15-year old from Minnesota, asked Reddit for help to parse state laws in an effort to gain immunization himself. Minnesota is a state where guardians can opt out of required vaccinations if they philosophically object to them. Lindenberger suggested that to empower teenagers and get more people immunized, states should lower the age of consent required for vaccinations instead of pushing for stricter immunization laws and dropping exemptions. The tension has complicated his home life. He says he regrets insulting the intelligence of his parents in the original Reddit post and urges other teenagers to be transparent and positive with parents when seeking permission to immunize. The stakes are high for his four younger siblings. His mother has already indicated that she will not allow his 16-year old brother to be immunized, although he wants it, Lindenberger said. He also has a 2-year-old sister, whose age exposes her to numerous infectious health risks. “It breaks my heart that she could get measles and she’d be done,” Lindenberger said.